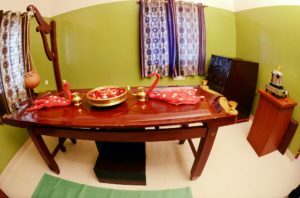 At Srivedamaayu, we look after the convenience of our guests. Apart from your routine treatment, we provide additional facilities to make your stay unforgettable. 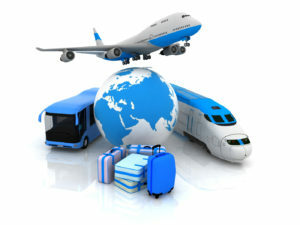 Apart from below, other requirements like public telephone, tourist transports are also arranged on request. At Srivedamaayu hospital we believe that it’s about curing the patient always and not only the illness, we have physicians and doctors who understand your health and give proper consultation for medication and treatment to give you the healthy life that you want. At Srivedamaayu an individual or a patient might be required to be admitted for treatment and special medication. In those cases rooms are available. 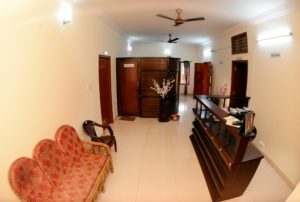 We have total 4 rooms for patients. At AC Deluxe room there will be 24×7 AC power back-up. Also there will be hot water supply with attached bathroom and double bed will be provided. There will be hot water supply with attached bathroom and double bed will be provided. There are 2 normal rooms for patients. hot water supply with double bed facilities will be provided. Hospital is equipped with free WI-FI service and laundry service on request. All major cards are accepted at our hospital. There are several ways patient will be treated and consultated. One among those is Outpatient Department. OPD in our hospital is an essential part and is designed for outpatients to meet with the doctors and have consultants regarding their health issues. At Srivedamaayu, OPD is available all throughout 7 days in a week. But Only on Sundays OPD is opened from 8am to 1pm. We provide healthy and nutrients veg food for our patient. 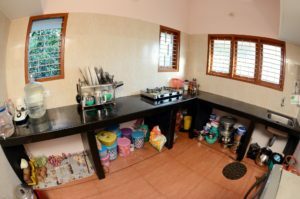 We have our own kitchen where healthy food are prepared and given to patients on the advice of our Physician. No outside food allowed. Foods are prepared as per the diet plan assigned to the patients. There is a separate cook to monitor various aspect of food given to the patients. 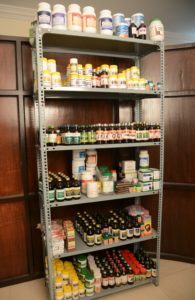 Our in house Ayurvedic pharmacy has a wide collection of herbal products for you to use and buy. We at Srivedamaayu have our own pharmacy were we prepare our medicine. Example: hair oil, skin care oil, anti diabetic medicine. Only on the advice of the physicians the pharmacy will be able to give medicines. At Srivedamaayu hospital we have 2 panchakarma theatres were facilities like hot water and steam box are provided. These are wonderful places for patients were they can peacefully perform panchakarma treatments. Srivedamaayu hospital have transportation facilities for pick up and drop on request only. Srivedamaayu will be sending their therapist to patient’s home for the treatment with-in 5km range. This will be done on special request of patients and as per physician’s advice. 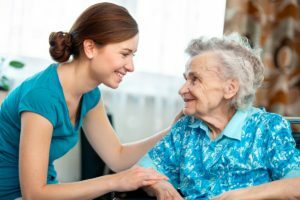 Patients are allowed to take admission in the hospital and they will be taken good care by our well trained care takers, this is on prior booking and special request only. 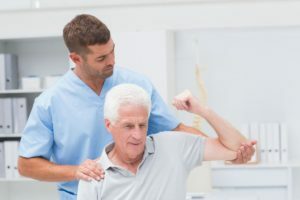 Physiotherapy is a physical medicine and rehabilitation speciality that, by using mechanical force and movements, remediate impairments and promotes mobility, function, and quality of life through examination, diagnosis, prognosis, and physical intervention. Physiotherapy treatments are given on the advice of chief physicians. Very effective treatment with absolutely no side effects. Very frendly and caring doctor and staff. One of the best Ayurveda Hospital. Good Hospitality and staff.